X-Men fans should own this 4k boxset and since it is never too early to start holiday shopping everyone should pick up a copy of this boxed set. In 1963 a group of mutants first made their appearance in Marvel Comic Books. They were called the X-Men. Almost forty years later the first feature film about this group of beings with extraordinary powers made its way to theaters. Directed by Bryan Singer (The Usual Suspects) it was pretty well received by critics and audiences alike. Singer returned for the sequel, simply titled X2, in 2003 but turned over the reins to Brett Ratner (Rush Hour) in 2006 for the final film in the original trilogy, X-Men: The Last Stand. As this franchise has grown we have had other movies about the X-Men with another one slated for release next year. In the meantime, the original three films have made their way to 4K UHD as a set to remind audiences what they loved about these stories in the first place. The first film introduces us to the cast of characters notably Rogue (Anna Paquin; True Blood), Storm (Halle Berry; Monster's Ball), Cyclops (James Marsden; 27 Dresses); Mystique (Rebecca Romijn; Femme Fatale) Professor Charles Xavier (Patrick Stewart; Star Trek: The Next Generation), Magneto (Ian McKellen; The Lord of the Rings Trilogy) and, of course, Wolverine (Hugh Jackman; The Greatest Showman). We learn about the school for gifted (mutant) children and see the discrimination that is prevalent in not only that world of make-believe but in our reality currently. We also see that not all mutants are hoping for a peaceful resolution but are planning for a revolution under Magneto's leadership. In X2 a failed attempt to assassinate the President of the United States creates controversy over mutants. Stryker (Brian Cox; Troy) plots to use Cerebro and Xavier to kill all the mutants while Jean is having more and more trouble controlling her powers. In the end, Jean (Famke Janssen; Goldeneye) saves the mutants but supposedly drowns in the process and Magneto once again escapes to scheme another day. The third film in the series, entitled X-Men: The Last Stand, has the mutants fighting for their very existence. Worthington Laboratories has created a "cure" for the X-gene essentially wiping out any trace of mutation in those that take it. While some mutants embrace this inoculation, others fear and loathe it which creates an all-out war with humans. Meanwhile, the X-men find out Jean isn't really dead and has been resurrected as her extremely dangerous alter ego, Phoenix. With her powers, she can pretty much destroy anyone but after a confrontation with the military where she knows she will kill everyone she begs Wolverine to stop her. He fatally stabs her which stops the siege but breaks his heart. This three-film collection is presented in 2160p high definition video which is wonderful to watch all the set. The colors are vibrant and the blacks are deep and true. The definition of the mutants is so incredibly detailed and rich. While I would have hoped the audio would be Dolby Atmos it is only DTS-HD Master Audio 5.1. Nevertheless, it is still excellent quality that is crisp and clean. The 6 disc set includes all three films in both 4K and regular Blu-ray and Digital. it also comes with hours of extras that if you haven't seen before are well worth watching. The beauty of these movies is the cast. Jackman was made to play Wolverine, a loner and tortured soul who can't help but care much to his chagrin. Stewart and McKellen are perfect as the elder statesmen of the mutants while being at odds with each other. The rest of the casts shine and complement the main characters nicely making for a complete package. The differences in the films can easily be seen especially in the third one. Ratner has a very different style then Singer and the changes, including a weaker script, are evident. Regardless, any X-Men fan should own this 4k boxset and since it is never too early to start holiday shopping everyone should pick up a copy of this boxed set. 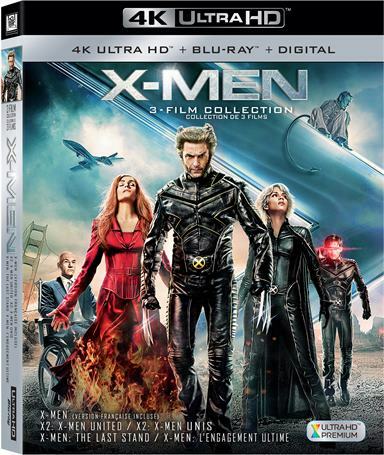 Download X-men Trilogy Box Set from the iTunes Store in Digial HD. For more information about X-Men visit the FlickDirect Movie Database.